The best book I've read in a few years. As much concerned with America's complicated relationship with black history as it is being a biography of James Brown. James McBride refuses to give a linear story, because no person's true story can be linear, and instead dives into the complexities and nuances of the man. Kill 'Em and Leave is passionate, well-researched, and honest in ways you don't expect in a book about a musical legend. If you have even a passing interest in James Brown and/or the music that emerged out of the black communities in the 50's and 60's, please read this. National Book Award winner James McBride goes in search of the "real" James Brown after receiving a tip that promises to uncover the man behind the myth. His surprising journey illuminates not only our understanding of this immensely troubled, misunderstood, and complicated soul genius but the ways in which our cultural heritage has been shaped by Brown's legacy. Kill 'Em and Leave is more than a book about James Brown. Brown's rough-and-tumble life, through McBride's lens, is an unsettling metaphor for American life: the tension between North and South, black and white, rich and poor. McBride's travels take him to forgotten corners of Brown's never-before-revealed history: the country town where Brown's family and thousands of others were displaced by America's largest nuclear power bomb-making facility; a South Carolina field where a long-forgotten cousin recounts, in the dead of night, a fuller history of Brown's sharecropping childhood, which until now has been a mystery. McBride seeks out the American expatriate in England who co-created the James Brown sound, visits the trusted right-hand manager who worked with Brown for forty-one years, and interviews Brown's most influential nonmusical creation, his "adopted son," the Reverend Al Sharpton. He describes the stirring visit of Michael Jackson to the Augusta, Georgia, funeral home where the King of Pop sat up all night with the body of his musical godfather, spends hours talking with Brown's first wife, and lays bare the Dickensian legal contest over James Brown's estate, a fight that has consumed careers; prevented any money from reaching the poor schoolchildren in Georgia and South Carolina, as instructed in his will; cost Brown's estate millions in legal fees; and left James Brown's body to lie for more than eight years in a gilded coffin in his daughter's yard in South Carolina. 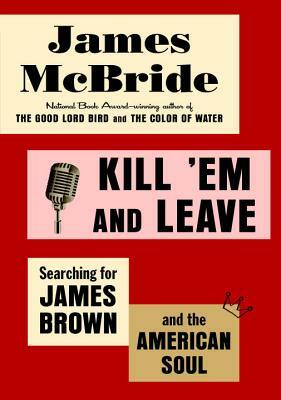 James McBride is one of the most distinctive and electric literary voices in America today, and part of the pleasure of his narrative is being in his presence, coming to understand Brown through McBride's own insights as a black musician with Southern roots. Kill 'Em and Leave is a song unearthing and celebrating James Brown's great legacy: the cultural landscape of America today. James McBride is the author of the National Book Award winner and New York Times bestseller The Good Lord Bird, as well as the bestselling novels Song Yet Sung and Miracle at St. Anna, and the #1 New York Times bestseller The Color of Water. He is also a saxophonist and composer who teaches music to children in the Red Hook, Brooklyn, housing projects where he was born, and a Distinguished Writer in Residence at the Arthur L. Carter Journalism Institute at NYU.